Are these really the ugliest student flats in Coventry? Conservation group The Coventry Society’s Paul Maddocks thinks so. 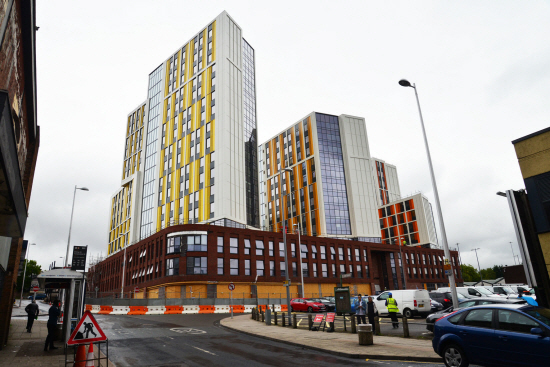 He has reignited the ‘studentification’ debate with a stinging attack in a controversial article about the brightly coloured towering development in Tower Street, city centre, highly visible from the ring road. Mr Maddocks refers to the tower blocks’ distinctive yellow and orange cladding, ‘characteristic cheap materials’ and tiny windows. Writing in a Coventry Action for Neighborhoods newsletter, in which he challenges Coventry City Council planners and developers, he states: “If you live in homes near Coventry University you might be welcoming the sight of the new purpose built student accommodation (PBSA). “The tower blocks are popping up all over the city centre. This could relieve the pressure of the houses in your neighbourhood being taken over by landlords and changed into student lets, with all that goes with that. “Alternatively you might be looking at the pile-em-high cells like a new government prison programme, but actually it is one of the most lucrative sectors in the UK property industry, currently worth £46billion, with developments expected this year expected to total a record £4.7billion. “Is it time to stop this tide of tacky tomb stones? Are they spoiling our built environment? “Hardly a year goes by without a slab of PBSA featuring on the Carbuncle Cup shortlist for the ugliest UK building. This year it should be Coventry’s Tower Street blocks with their brightly coloured scattergun splurge of yellow and orange cladding. “It is not hard to see why PBSA is such a booming industry: you can build tiny bedrooms with minuscule windows, use cheaper materials, and cram many more units on to a site, with no need to provide parking or private amenity space. Unlike housing, the flats don’t have to be individually marketed, there’s a ready supply of students, and you only have to please the customer for three or four years. “Local authorities like Coventry are only too happy to encourage the march of new student flats, given that they take pressure off existing local housing stock, while universities are over the moon, as it means they don’t have to spend precious capital budgets on building their own accommodation. It is the perfect storm, with no party to stand in the way. “The growth is also being fuelled by some of the most powerful backers in the world. Since the slowdown in the high-end residential market, the kinds of overseas investors who were originally pumping their hot cash into the super-prime apartment bubble are now funneling it all into student flats. “It may seem unlikely, but these grim tankers of rabbit-hutch digs are where the sovereign wealth funds and ultra-high-net worth individuals are now choosing to park their capital. “Is it going to help stop the tide of local houses being turned into Houses of Multi-Occupation (HiMOs)? “Well it’s difficult to say, if the two universities continue to grow, constructing new buildings and expanding their student population, it’s not going to stop – its a business, if it’s making money it will not stop. It will only grow larger and larger. Who is going to stop them? Only market forces. “PBSA is now described as ‘luxury’ and international students are now demanding this quality. Given the competitive nature of the market and the kinds of returns investors are expecting, developers are being forced to compete with ever more elaborate offers, stuffing bedrooms with gadgets and applying a thin veneer of ‘luxury living’ to their cheaply built shells; 40-inch smart televisions are standard along with 24-hour concierge, gym, swimming pool and omnipresent CCTV coverage. The Coventry Society and even the city council’s former conservation officer Chris Patrick have also objected to certain student tower block developments on grounds of being incompatible with the city’s prized medieval and post-war architecture – much of it listed nationally for its national importance. They include the giant student accommodation towers planned for next to the Grade1 listed Whitefriars. Similarly high student tower blocks are currently going up further along the ring road at Fairfax Street car park opposite the sports centre. The development by Barberry Group is at Bishopgate where the former Royal Mail sorting office stood. Prices range from about £6,500 to £9,500 for the academic year. There are around 30,000 Coventry University students and around 25,000 from the University of Warwick – and the figures are set to rise. Campaigners have argued the number of HiMOs in Coventry has already far exceeded levels in other cities, some of which have banned them. But there are signs the boom of HiMOs in Coventry is on the wane. Coventry University is selling off the majority of family houses it bought for conversion to student flats because of falling demand, it says. 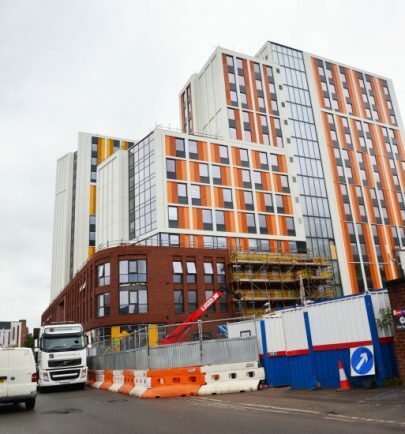 Coventry City Council argues its policy on pursing PBSAs is helping solve the issue of student housing sweeping residential neighbourhoods, and harming communities. Developers Barberry Group declined to comment.